President Donald Trump, center, sits between Canada's Prime Minister Justin Trudeau, right, and Mexico's President Enrique Pena Nieto after they signed a new U.S.-Mexico-Canada Agreement that is replacing the NAFTA trade deal. Trump's top trade negotiator, Robert Lighthizer, told lawmakers during a recent congressional hearing that if they don't pass the trade agreement, the United States will have "no credibility at all'' with future trading partners, including China. "There is no trade program in the United States if we don't pass USMCA. There just isn't one,'' Lighthizer said. "I don't think anyone wants to blow it up, but there is interest in strengthening it,'' Blumenauer said. Rep. Vern Buchanan of Florida, the ranking Republican on the trade subcommittee, said he believes the vast majority of Republicans will end up voting for the agreement. He's tried to assure Democratic colleagues that Republicans were "open-minded to try and get some things done'' to address their concerns. "You put a lot of jobs at risk if this blows up,'' Buchanan said. 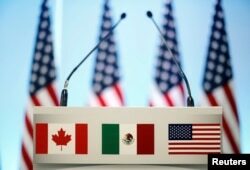 FILE - The flags of Canada, Mexico and the U.S. are seen on a lectern before a joint news conference on the closing of the seventh round of NAFTA talks in Mexico City, Mexico, March 5, 2018. "Never has NAFTA been so popular,'' Sciarra said. Dan Ujczo, a trade lawyer and Canada-U.S. specialist in Columbus, Ohio, said the trade deal could pass "relatively quickly'' once the tariffs are removed.